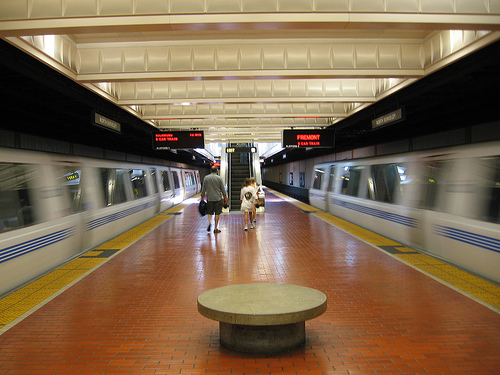 It’s official: Next month, BART will raise its prices, cut its service and reduce its employment, oh my! The average cost of a ride will be 6.1 percent more. On weekends and during evenings, trains will come every 20 minutes instead of every 15. Waah! Want to go into the city for some shopping? Your roundtrip will be $7.30 (PDF link) instead of the previous $6.80. If you’re flying in and out of SFO, expect to cough up $17.30 for your back and forth. Live it up, suckers. We’re sure the price-hike will deter some city gallivanting, but we would also like to remind you that the AC Transit F bus will take you from campus to the Transbay Terminal in San Francisco for $0 with your Class Pass. From the terminal, you can hook up with a MUNI bus. Sure, it’ll take, like, an hour, but at least you’re saving yourself some dough while you’re still unemployed. I must say, the F is a little sketchy, especially the transbay terminal in SF. That’s definitely the worst part…but hey, you can’t beat the FREE fare. The price to get to/from SFO is ridiculous though. It looks like I’ll be flying out of OAK from now on! We should be expanding and encouraging public transit, not the opposite. To get to SFO you can take the F to the Transbay Terminal for “free” with your Class Pass then take the Sam Trans KX to SFO for $4.50 each way. The KX stop in in the front of the Transbay Terminal. The F from campus to the Transbay Terminal is about 45 min. The KX from the Transbay Terminal to SFO is about 30 min.